A growing number of Americans are moving into homes nestled between the idyllic beaches of the Florida Keys — part of a national trend that’s seeing coastal populations swell even as the seas swell dangerously around them. 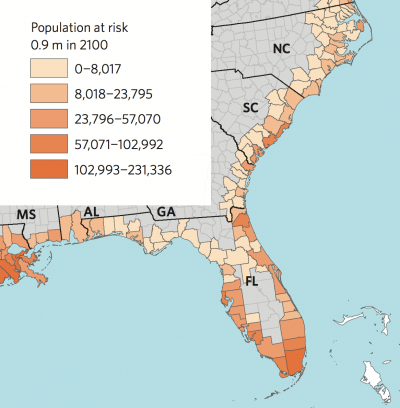 That combination of rising populations and rising seas could see millions of Americans living in homes that flood regularly during the decades ahead, according to a nationwide analysis published Monday in the journal Nature Climate Change. 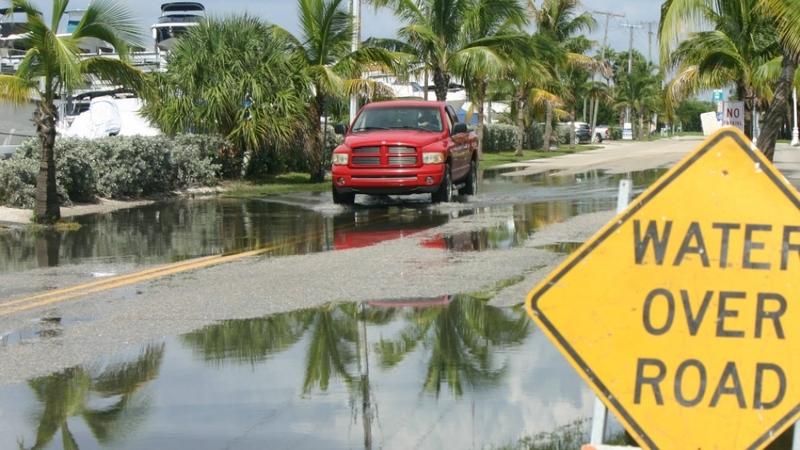 Flooding is already routine during high tides and storms in parts of Florida. That’s unless steps are taken to protect homes, relocate populations or redirect development into regions with higher elevation as rising levels of greenhouse gas pollution continue warming the planet, which is causing the seas to rise. In Florida’s Monroe County, home to Key West and other iconic tropical islands, more than half of the fast-growing permanent population could see their homes flood most days by century’s end, the analysis concluded. Scientists combined local population trends with conservative projections for sea level rise to conclude that the homes of 4 million Americans would be inundated during high tides following 3 feet of sea level rise by 2100. Preliminary steps for adapting to rising seas are already being taken in Monroe County and in some of the other vulnerable regions highlighted by the analysis. If fossil fuel burning and deforestation continue at current rates, potentially leading to 6 feet of sea level rise by 2100, the researchers projected that the number of Americans living in homes that flood daily would jump to 13 million. Most of those 13 million people would be living in the U.S. southeast, the analysis revealed, and more than 6 million of them would be living in Florida. 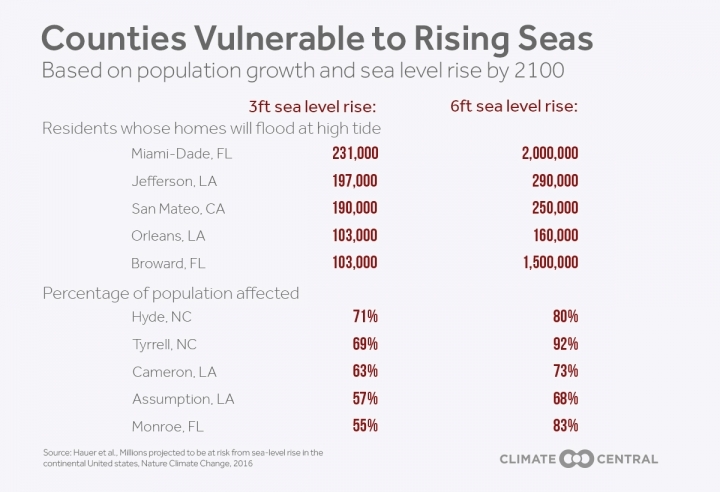 Other areas would also be impacted: California, New York and Louisiana alike would be home to about 1 million people apiece whose homes could flood at high tide in 2100 if seas rise by 6 feet. The results are highly speculative. They assume that developers will continue building homes in coastal hubs the way they currently do and at current rates — even as seas rise around them. They also assume that residents will remain in their homes as flood waters rise. Nobody knows how American communities will be reshaped as flooding continues to become more routine. That made it impossible for the researchers to adjust population projections to account for sea level rise. The findings reveal the vast scale of the dual problems of fast-rising populations in low-lying coastal areas affected by rising seas. They also show that the risks will be concentrated heavily in some population centers as Americans move to coastal cities in pursuit of sea changes in their lives. “We’re really looking at very localized impacts of sea level rise,” said Mathew Hauer, a University of Georgia demographer who led the research. The problems could be starkest in Miami-Dade County in Florida, where 231,000 residents could be living below the daily high-tide mark if seas rise 3 feet by 2100. That would be about 4 percent of the county’s population. If seas rise 6 feet, the problem could affect nearly 2 million residents of the county in 2100 — more than a third of the people who are expected to live there. In terms of percentage of population affected, Monroe County, which includes Key West and other islands, would be one of the hardest hit. If seas rise by 6 feet by 2100, the researchers project that 83 percent of its residents would endure daily flooding. Hauer said it’s impossible to say how different communities will respond to rising seas, pointing out that tribal communities in Alaska and Louisiana are already being relocated from coastal areas afflicted with rapid erosion — a strategy called “managed retreat.” He said the costs of such solutions could rise substantially over time. Coastal housing could also be adapted to cope with regularly inundation, such as by being built on stilts or developed in neighborhoods with higher elevations. Hauer pointed out that the population of Venice, Italy, continues to grow, despite inundation in some areas. Projected flood risks following 3 feet (0.9 meters) of sea level rise by 2100 in the southeast U.S.
Monroe and Miami-Dade aren’t just exemplars of dangers. They’re also providing examples of how other coastal American communities may begin to respond to rising instances of flooding. Even as state and national political leaders in Florida downplay the hazards of global warming, local leaders are leading the nation in working to reduce the danger that is coming to define climate change in the Sunshine State. Sea level rise models are already being consulted whenever county buildings are planned in Monroe. A firehouse was recently built a foot and a half higher than originally planned to account for future sea level rise, adding about $150,000 in costs to the $3 million project, Haag said. “When you spend a little bit of money upfront on the planning, you can save a lot in the long-run,” Haag said. In 2014, a Miami-Dade sea level rise task force published what its chairman described as an “urgent, though optimistic, call to begin the step by step process needed to design and build a re-engineered urban infrastructure” capable of withstanding sea level rise. “Make no mistake, it will be costly, but its costs are dwarfed by the potential human, physical and economic values at stake,” the chairman, County Clerk Harvey Ruvin, wrote in the introductory letter to the group’s report. Such planning could help reduce the number of Americans impacted by rising seas during the decades to come, alleviating the severity of the dangers highlighted in Monday’s study.